At The White Window, a home décor store she started with friend Gurlein Manchanda, Twinkle gets her chance to spread her creative wings. And, feel liberated too. The 3,000-sq ft store in Mumbai's busy Crawford Market area sports a chic, clean, all-white look inspired from a Spanish Hacienda. Embellishing the wooden-floored store are huge potted plants. Combine them with textured walls, stone pillars and wooden beams, and you feel that you are out in the open. Then there is the unusual perpendicular fish tank made of three glass handis, which makes a dramatic statement. It seems to symbolise the store's ambience — tranquil and relaxed. Says Gurlein, "We wanted The White Window to be a place where people could browse at leisure. They should pick up stuff, feel it, soak in the atmosphere. Buying comes later, first they should feel at home." The store has been a natural extension of the duo's work as interior designers for the last two years, under the name of their firm Mock-Ups. "Besides my own home, we have done up many homes, including actress Tabu's," informs Twinkle. While doing interiors for other people, Twinkle and Gurlein would never find the right home accessories like light fittings or candlestands. So they did the next best thing — they designed the accessories themselves. The concept of The White Window was born then. A place where you can find elegant yet practical pieces of home furnishings, artefacts and crockery. Says Twinkle, "Anyone who walks into White Window will find something to his or her taste. These are beautiful things, which we would like to see in our own homes." One of The White Window's biggest attractions is the stuff designed by American metal-ware designer Micheal Aram who has made a name for himself with his curious handcrafted home accessories — cutlery with human-figure handles, animal-shaped doorknobs, a steel chair in the form of a vertebral column or steel vases in geometric shapes. New creations from the designer will be available every three to four months. 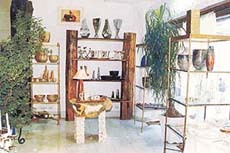 Delhi's Manna, another noted designer, has her Murano-like handmade glass articles displayed here. The mugs, vases and plates have the same gloss, finesse and vivid jumble of colours like their Venetian originals. The icing on the cake is the cost, of course — all are priced at half of what they would cost abroad. Twinkle's mother Dimple Kapadia's candles bearing the brand name Faraway Tree are also on display here. "Well, naturally we had to get the best collection. We made her work hard to give us unusual pieces," remarks Gurlein with a twinkle in her eye. The store also has an interesting linen collection. Some pieces like the red on white floral patch-worked sheet tucked into the wooden four-poster bed placed right in front of the store entrance are eyecatching. Home furnishings designer Reva as well as Gurlein and Twinkle have designed the linen, including the curtains, pillow covers, etc. Designer Anurag Kanoria has worked on the beds. The store also displays and sells the art of Anjolie Ela Menon, Yusuf Arrakal, Krishnamachari Bose and Sunil Padwal. In fact, Padwal has also designed some lights and fittings that are on sale. Also being sold are Ishika Mohan's black and white prints. A funky collection from German glasswork-line Ritzenhoff gets a proud corner. Twinkle says, "Our tastes are reflected in our White Window line. This has a trendy range of home accessories, including furniture like sofa sets, beds and tables, stylish home linen, finely crafted lamps and lights, candle-stands, trays, picture frames and various other tasteful artefacts. Romantic curtains with real leaves stitched in-seam also add to this unique line." Is there more creative satisfaction in interior decoration than acting, you ask Twinkle. "Actually, each has its own place. Besides, it is satisfying to see your creation in someone's house," she smiles. For now, she is actively involved in the day-to-day running of the store and hopes to break even in a year. And the future? "On the opening day, the response we received was encouraging. For now, we are concentrating on this and getting new collections. We want to showcase unique yet livable home décor items at affordable prices," she says.